Dr. Wendy Emerson attended Danvers public schools and received her Bachelors degree in animal science from the University of Maine. She attended Tufts Veterinary School, graduating in 1985. Dr. Emerson is also an active member of many national veterinary groups, including the American Veterinary Medical Association and American Animal Hospital Association. She has been very active in organized veterinary medicine, and is a past president of the Veterinary Association of the North Shore and the Massachusetts Veterinary Medical Association. Dr. Emerson's professional interests include avian and exotic pet medicine, surgery, and dentistry in all species. She currently resides in Topsfield with her husband, stepdaughter, two dogs, one cat, and two guinea pigs. Her 2 parrots, Rafiki and Sugar, live at the clinic and can frequently be heard chatting away in the hospital's quiet moments. When not at the clinic Dr. Emerson enjoys traveling and riding her horse, motorcycle and bicycle. Dr. Rachel Illingworth has been with Putnam Veterinary Clinic since 2006. Growing up on a dairy farm in Nova Scotia developed her keen interest in animals. 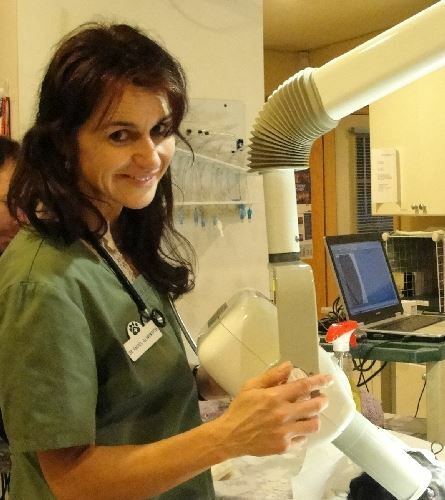 She graduated from the Atlantic Veterinary College and is a member of the American Veterinary Medical Association, and has practiced in the United States since 1993. In her spare time, Dr. I may be found trying to hit small white balls into little round holes, or traveling with family and friends. Dr. I's furry and feathered family consists of a rambunctious corgi, a sweet mixed breed dog, and an African grey parrot.